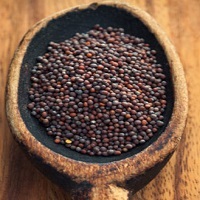 Mustard seeds are the small round seeds that are of different mustard plants. The seeds are typically around 1 or 2 mm in length. Mustard seeds can of various colours from yellowish white to black. They are a part of vital herbs in several local foods. The seeds can originate from three diverse plants and they are brown Indian mustard, white mustard and black mustard. Mustard seeds normally take three to ten days to grow if located under good conditions, which should comprise of a cold atmosphere and moderately humid soil. If Mustard seeds are adulterated with argemone seeds then they will have a sandy and uneven surface. If pressed, the inner part of the argemone seed will be white whereas mustard will be yellow.